Pest description and crop damage Cutworms that attack tree fruits include the spotted cutworm and the variegated cutworm. 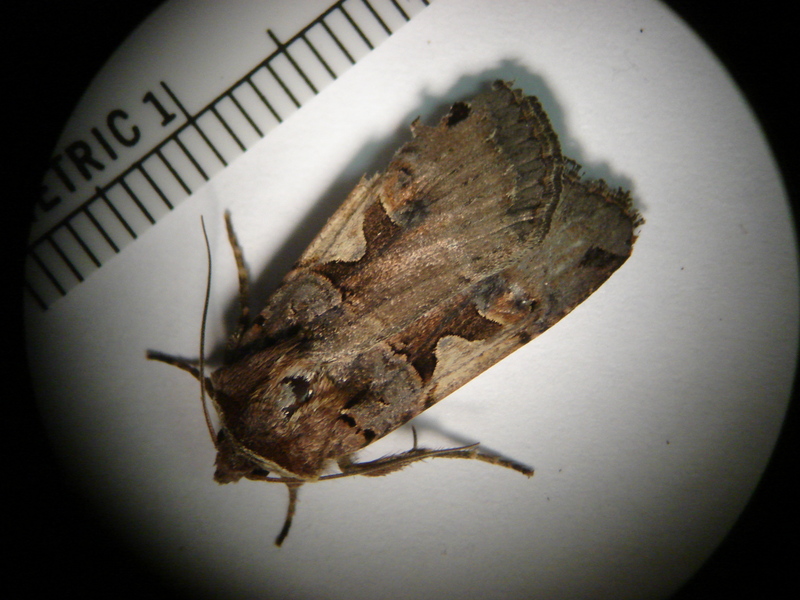 The adults are large moths ranging in color from gray to brown with spots on the wings. These moths are attracted to lights. Larvae are dirty white, reddish, gray or black caterpillars up to 2 inches long. The larvae of these moths feed on buds and leaves, chewing holes in buds and ragged holes out of leaves. They also feed on the growing tips, particularly on small trees or in high-density plantings. On larger trees, most of the feeding is on the lower branches, and may be limited to a few stems or limbs, while other stems are undamaged. Biology and life history Weeds are the preferred source of food for these larvae, and eggs typically are laid on weeds around the trees. Depending on species, they may overwinter as pupae or larvae in the soil. The larvae spend the day in the soil, then climb up the tree during the day to feed, often following the same path. Control weeds, grasses, and debris in the orchard that provide cover. Encourage natural enemies of cutworms like birds and spiders. Hand-pick cutworm larvae, using a flashlight to find them, if practical. Scratch the soil at the base of plants to find larvae in the daytime. Caterpillars can be trapped by tying plastic wrap tightly around branches and trunk, then applying Tanglefoot or a similar sticky material to the plastic wrap. Remove these in the fall. kaolin-Applied as a spray to leaves, stems, and fruit, it acts as a repellant to some insect pests. Some formulations are OMRI-listed for organic use. Bacillus thuringiensi var. kurstaki (Btk)-Some formulations are OMRI-listed for organic use. Apply thoroughly to lower trunk of tree.